Tau Kappa Epsilon had its charter suspended by its national organization at the end of last month after a member was arrested for marijuana use. Updated: Oct. 10, 2014 at 12:33 a.m.
Tau Kappa Epsilon’s charter was temporarily suspended by its international organization at the end of last month because of an ongoing investigation following a marijuana arrest. Members of TKE have been asked to sign release forms opening their academic and conduct records to the international organization, said Nancy Sterling, a spokeswoman for TKE. She said the suspension would be temporary while the investigation is ongoing. Once the international organization moves the investigation forward, members could be kicked out or the GW chapter could lose its charter, Sterling said. “All of those things are always possibilities, but I don’t want to speculate since the review hasn’t taken place,” Sterling said, adding that members were “in the process of submitting” their records. If the international organization revokes TKE’s charter, it would be the second chapter to be booted off campus this year. 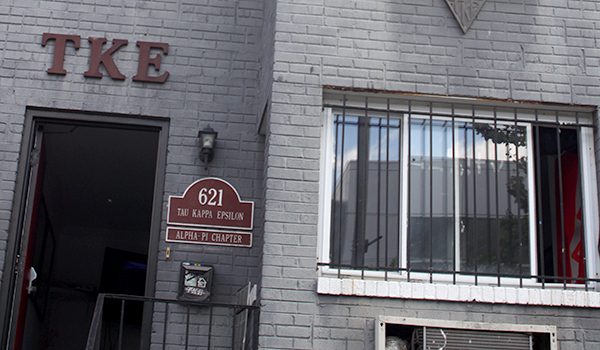 Alpha Epsilon Pi shut down last semester after facing 17 counts of hazing, drug and alcohol violations. Adithya Sharma, the chapter’s president, said one member was arrested for marijuana use. He declined to provide further details about the incident or say when it occurred, deferring to the international organization. “At this time, we would not like to or are allowed to comment on the investigation,” Sharma said in an email. TKE will not be able to host events, recruit members or join in other activities in the Greek community while its charter is suspended, Sterling said. She said the suspension will also have a “significant impact” on the newest members of TKE, who were recruited during rush events last month. Sterling said initiating those new members into the fraternity would “get delayed” while the investigation continues. Sterling said University Police Department officers found three TKE members smoking marijuana in a residence hall with four other students who were unaffiliated with the chapter. She said Sharma has reached out to GW’s Greek life office and the chapter’s international organization for support. University spokesman Kurtis Hiatt would not confirm if an investigation was occurring or provide details about the investigation, citing a University policy to not comment on the status of an investigation. Hiatt deferred to the University’s public list of sanctions against student organizations. TKE is now cited on the list for underage drinking and hosting an unregistered party last winter. The website posts all completed sanctions against student organizations but does not provide details about the incidents. “GW takes seriously the health and safety of members of the University community and through the Code of Student Conduct promptly addresses incidents involving student organizations that result in charges of misconduct,” Hiatt said. Sterling declined to provide details of the conversations with GW or say who at the University was contacted by the international organization. “We are working together with the University and we have been speaking with officials there. I won’t go into those discussions since that is up to them and I don’t want to characterize them,” she said. Peyton Zere, president of the Interfraternity Council, which oversees fraternity life, also did not return a request for comment. The Hatchet incorrectly referred to TKE as national organization rather than an international organization. We regret this error. The post was also updated to reflect that the suspension is temporary pending the results of the investigation, which Sterling clarified after publication. This article appeared in the October 9, 2014 issue of the Hatchet.